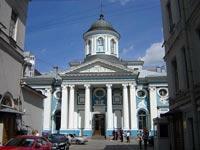 The church is located behind the red line of Nevsky Prospect in the interior of the area between the houses 40 and 42. The beautiful church stands in the recess of a gap between the houses. On the 2nd of May 1770 the Empress Catherine II signed the Ukase to give a plot on Nevsky Prospect for construction of the church. The building was started at the initiative and at the expense of the prominent figure of Armenian Liberation movement, Ovanes Lazaryan in May 1771. Between 1771 and 1780 the church was constructed after the design of the architect Yury Felten. The archi­tect himself supervised the construction. On the 18th of February 1779 the temple was sanctified. The temple is crowned with a dome. This elegant dome rises over the church building. The main entrance of the temple is embellished with the four-column Corinthian portico. The columns are faced with marble. The portico is crowned with a triangular pediment. The interior de­corations of the temple are classically simple and fine. The interior was rebuilt many times. Between 1771 and 1775 the eastern wing of the build­ing was constructed after the project of the architect Yury Felten for the clergy of the temple. It was a high two-storey building. The western wing was constructed between 1794 and 1798. It was a high three-storey building with a beauti­ful façade. Between 1835 and 1837 the eastern wing was rebuilt after the design of the architect Abram Melnikov. In 1841 the church was restored by the architect Lev Vendramini. At the end of the 19th century the church building was divided into two floors. Many famous people visited this church. Between 1854 and 1872 the poet Fyodor Tyutchev lived with his family in one of the wings of the church building. They were invited by the family of Abamelek-Lazaryan. In May 1930 the church was closed. One of the wings was given to the German confectionary firm “Oetker”. At the end of the 20th century the church was restored and returned to the believers. Since 1993 the services are held in St Catherine’s Armenian Church.